Wichita, Kansas has a population of 390,591 as of the census in 2017. The major industries include aviation manufacturing, cattle production, agriculture and energy. The median household income for a family is $57,088 and the average hourly wage is $23.78. This is only two percent lower than the national average. As of October 2016, there were approximately one thousand restaurants in Wichita. This makes for a lot of competition. I looked online to see what type of barbecue restaurants there were and there were not that many. Amazingly the reviews online are sparse but helpful. Here are three restaurants that have rated at least a four-star rating. Hog Wild Pit Bar-B-Q has seventeen restaurants five of which are in Wichita. The furthest away is in Phoenix, Arizona. They have won numerous awards for their amazing barbecue. 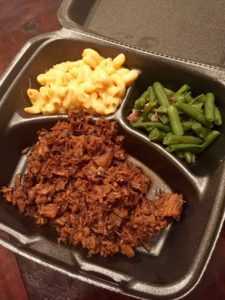 Using the slow smoked put barbeque Hog Wild Pit Bar-B-Q produces mouth-watering pulled pork, spicy hot links, beef brisket and tender pulled pork. They offer Family BBQ meals for four to sixteen people for those nights you just do not want to cook dinner. Have a special event you want catered? 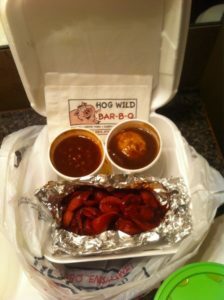 The Hog Wild Pit Bar-B-Q would love to cater you event. They will set up a buffet-style meal that is sure to please your guests. They include napkins, plates, utensils and any equipment you may need. They do have over four hundred posts on their 47th Street location alone. 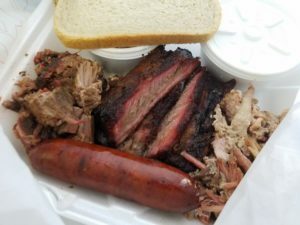 So, for a great barbecue meal, look to Hog Wild Pit Bar-B-Q. The Pig In! Pig Out! BBQ and Catering was opened in April 1996 by Ron Cochran. They are located in a remodeled Tasty Freeze that was built in 1948. Across from the Lynwood Park, Pig In! Pig Out! is run by his son Derek who, after Ron’s sudden death, strives to keep his father’s business by continuing to use the cooking processes and original rub recipe. Ron did not go to school to learn how to become a Pitmaster he stumbled on it by sheer will and a natural ability to cook. He first got the bug when he entered into contest to build a smoker. He took advantage of his position as a welding supply salesman to get the material he needed donated by customers and the welding supply company. With only two weeks to build the smoker, Ron spent time after work and on the weekends and one overnighter to create his masterpiece. His design was so unique that in order for people to get an idea of what he was doing he wrote “Pig In” on one side and “Pig Out” on the other joking that you put the pig in one end and it comes out the other. Surprisingly Ron won first, a second, a fourth and a fifth-place ribbon in the competition. This fired up his passion to enter more contests and keep smoking meat for friends and family. Before he knew it, people were asking him to cater events and food for the holidays. This catapulted him into the restaurant business and it has grown since them. At one time Pig In! Pig Out! 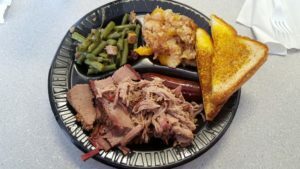 BBQ and Catering was one of the seventh ranked barbecue in the growing barbecue circuit. The reviews on the internet give them high marks. 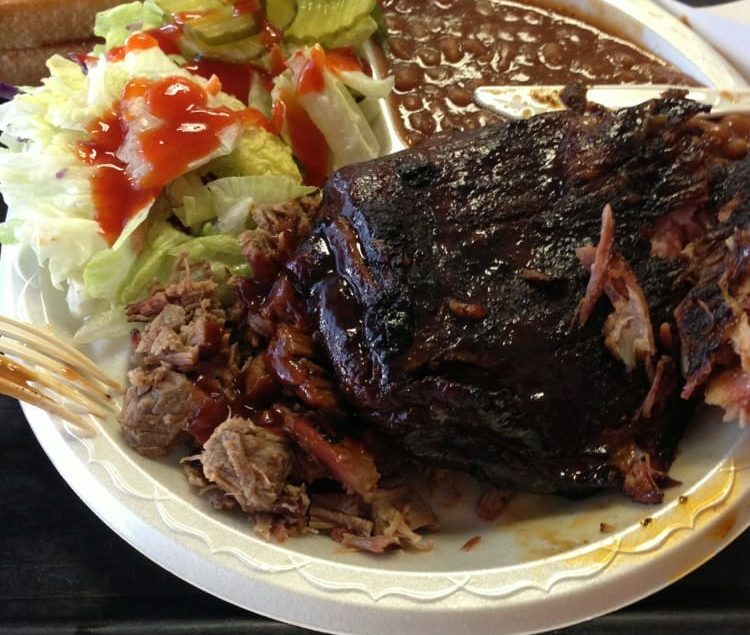 Two Brothers BBQ has three locations in Wichita and one in El Dorado. The original Two Brothers is the Greenwich Road location. It was originally a barbecue restaurant the one of the brothers worked and learned the secrets of cooking meats slow and low using hickory wood. Eventually he bought the restaurant and was joined a few years later by his brother to run the restaurant. Now family owned, Mark and Matt Ryan have partnered with their parents, Carole and Tom Ryan to run the four restaurants. Unlike most restaurants that duplicate themselves, they decided each restaurant should have its own unique décor and menu that reflects the neighborhood. They added The Burger Grill to three of their Two Brothers BBQ locations because they wanted to add more of a variety on the menu for families. They use only the finest freshly ground beef, fresh toppings and locally baked buns. Like most barbecue restaurants, Two Brothers BBQ also love to cater events. They will cater any event you can imagine from buffet breakfast to lunch to dinner their goal is to make you look good to your guests. They also have liquor license for your special event. They get rave reviews on the web. Wichita Hood Cleaning Pros has brought you this article. Restaurants in the Wichita area use Wichita Hood Cleaning Pros to do their commercial exhaust kitchen cleaning.